Perhaps you’re of Spanish heritage, maybe your best friend is Chinese or possibly you just love all things French? If it’s a nursery print you want in a different language or if your children are bilingual, look here to find the perfect print for a child’s space. Grace Hester Designs has your bilingual needs covered. Nursery rhyme, alphabet prints and birth announcements are available with Spanish, French, Japanese and Chinese language versions. 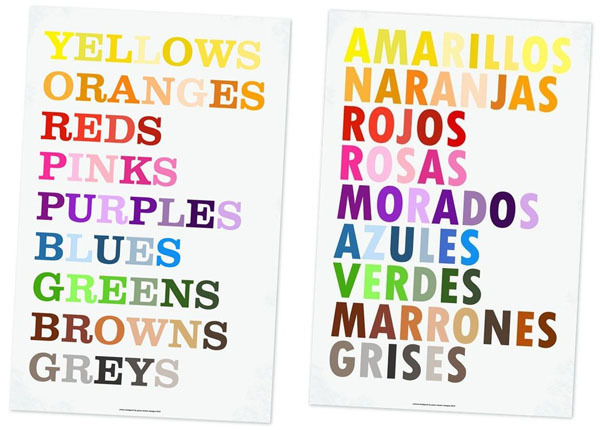 I adore the Colours poster, pictured above in both English and Spanish versions. The varying shades of each colour is a fantastic and sneaky way to incorporate a shot of colour into a neutral space without being obvious. 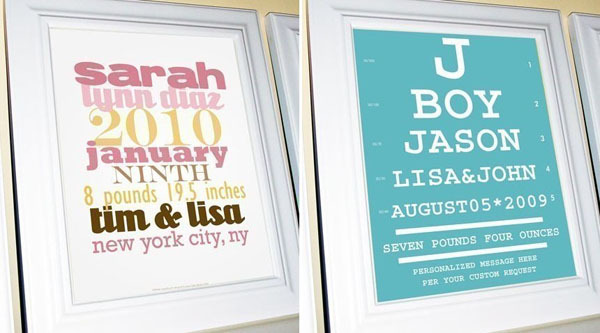 The Birth date keepsake print (US$30) is nothing short of stunning. In terrific typography design, the font variety and colour is all you need for a fabulous keepsake print. And if a print isn’t enough, you can now order birth announcement cards (US$75 for set of 25) in the same design so all your friends and family can enjoy these mini works of art! To see all that’s available (and there’s plenty!) head on over Grace Hester Designs, who will ship internationally to Australia.